Do you think it or do you know it? Years ago I advised a CEO whose first question, whenever anyone came to him with a bold statement or seeming revelation related to the business was “Do you think it or do you know it?” He constantly challenged his leaders to test their assumptions. And as we walked through numerous coaching sessions, I saw that he also asked himself this question frequently. He led by example to test what he thought he knew versus what he really knew. David Dunning and Justin Kruger know something about this topic. In fact, roughly a decade and a half ago, when they both were professors in the psychology department at Cornell, they studied the subject extensively. Their “guinea pigs” were Cornell undergraduate students. And their findings were seminal. They subjected their subject students to a series of assessments to test their knowledge in several disciplines, including logical reasoning and English grammar. The linchpin of Dunning and Kruger’s study was also to ask each student to self-assess his or her own knowledge in the same disciplines. Their findings revealed a phenomenon that many of us undoubtedly intuitively understand. They observed that the test-taking students mistakenly assessed their knowledge as much higher than it really was. There was an inverse correlation between self-assessed knowledge and ability, and actual knowledge and ability, across the disciplines studied. In other words, the less you know, the more you think you know. This phenomenon has become known as the Dunning-Kruger effect. And we see it every day, in political discourse, in sports, in the financial decisions we make and, at the risk of “I told you so” in the event my wife should happen to read this, in our day-to-day marital and personal interactions. When this thought process manifests itself in the business world, it can do so with devastating and long-lasting effect. When untested and unfounded assumptions guide the strategic business decisions we make, we run the risk of taking the company down the wrong path, one that may not be reversible when we realize the errors of our ways. In my thirty-plus years in the business world, one of my greatest frustrations has been the role “tribal knowledge” (along with its inherent bias) plays in the decision-making process in so many organizations. And sometimes it can characterize an entire industry. Sound familiar? If so, you’re not alone. The body of organizational assumptions and beliefs accumulated over many years of “doing” is not always wrong per se, but when a “we’ve always done it that way” culture impedes an organization’s ability to learn, to challenge its collective assumptions, to apply fact-based principles to the decision-making process, to adapt to the ever-changing world in which we live and work … that’s when the organization is at the greatest risk of making bad decisions. More about this in my next article. 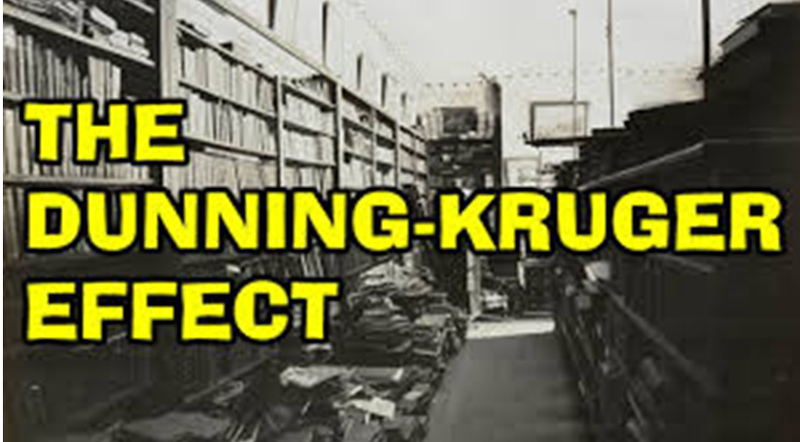 Professor Dunning is retired now and Kruger has moved on to NYU Stern School of Business, but their influence should be indelibly ingrained in our minds.